This lesson is super easy and fun! The audio file teaches the exercises for you! You'll have a blast doing these four simple exercises with your children in your second language. Let's get started! Just your bodies and enough room to stand and move in place. The Parent Learning Video teaches you how to pronounce the four exercises. You want to feel confident pronouncing the exercise words before teaching them to your children. As you're watching the video, look at the page below entitled Activity 4 Game: Exercises. This page is your "cheat-sheet". See how each word is written in English followed by Spanish and there's a pronunciation key to the right of each word? Read the pronunciation key as though you're reading English and your pronunciation in Spanish will be really good! Be sure to stress the syllables that are in bold and underlined. We try to make everything as simple as possible when it comes to families learning Spanish! After you're comfortable pronouncing the words, watch the Parent Teaching Video which walks you through how you're going to lead your children in excreting in Spanish! Tell your children that you're going to listen to the exercises and do them together. 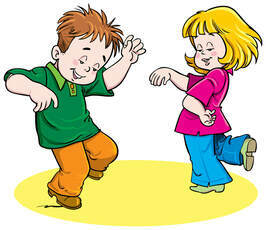 Encourage your kids to repeat the exercise with the audio file and with you too! ​Be DRAMATIC! as you do the exercises and your kids will want to be DRAMATIC JUST LIKE YOU! Smile and show them you're having fun and they'll be more eager to join in and have fun too! When you hear the word for "Stop" which in Spanish is "Alto" FREEZE YOUR BODY IN FUNNY POSITIONS and point out when your kids freeze their bodies in funny positions too. This will make the activity more fun! If your children like animals they'll enjoy watching Oso, our dog do the exercises while in my arms! If you have a dog or a pet, encourage your children to hold them while carrying out the exercises! After doing the exercises with the audio file several times you should feel confident pronouncing the words in Spanish. Now you're ready to lead your kids in the exercises without the audio file. See who can "Freeze" the fastest when you call out "Alto" (Stop). Repeat this as long as your children are interested. Remember, the more dramatic and excited you are, the more engaged your children will be! ​When relatives or friends come over, brag to them about how your kids can teach exercises in Spanish! Ask them if they'd like to learn a few exercises. 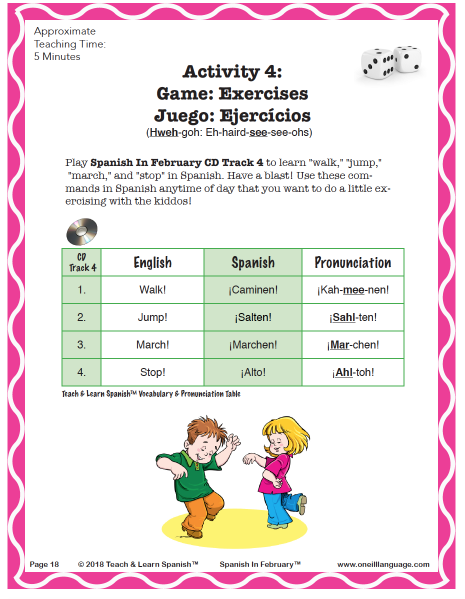 Get your kids excited to teach the exercises to visiting relatives and friends in Spanish. Consider recording your kids leading others in Spanish exercises and post it on Facebook for your friends to see and like/love/comment on! How cool will it be that your children are teaching Spanish to others! Wow! Do the exercises every morning before going to school, or every afternoon when arriving home or after dinner. Find a time that works well with your family's schedule. By doing the exercises for 5 minutes a day you're literally becoming a "bilingual home." You should be very proud of yourselves, mom and dad! Learning a second language is a lifelong gift you're instilling in your children, and in yourselves too!